It's hard to believe that my L.A. trip is over already. I had been looking forward to it since my aunt and I planned it a few weeks ago. And it's over :( BUT, we couldn't have had a better time!!! This is supposedly Justin Timberlake & Jessica Biel's fence! Afterwards, the concierge got us tickets for Jimmy Kimmel! So, we waited in line for over an hour and a half. Rather ridiculous if you ask me. But, it was cool to see the show. We saw Matt Damon, Dr. Phil & Brett Eldredge performed!! Then, we headed back to the hotel to get checked in and freshen up so we could go get a bite to eat. We enjoyed a nice dinner at The Grill on the Alley, which was by our hotel. We were exhausted from such a busy day so we were in bed by 10pm! View from our room - Hollywood sign in the distance & the church you can see part of was used in the Sister Act movies, Wedding Crashers & many more! Tuesday we woke up around 7:15am and got the day started. We headed out to walk Hollywood Blvd. 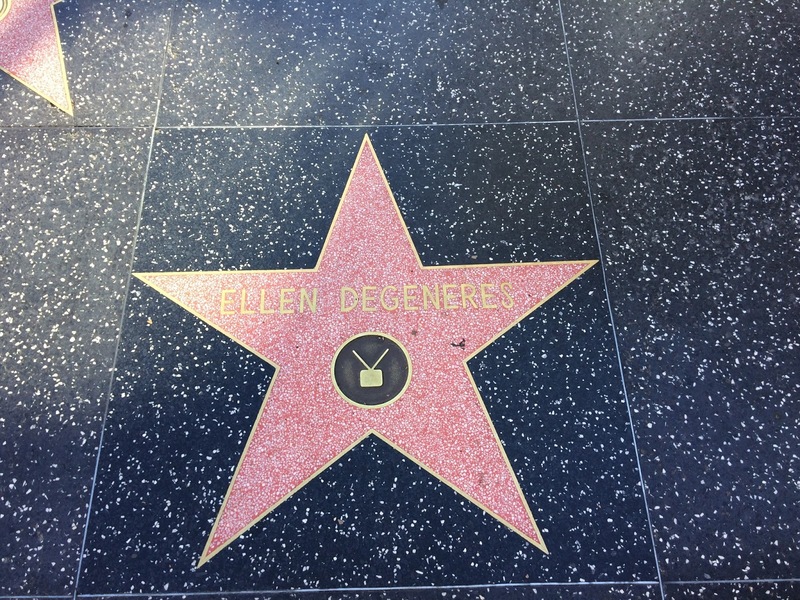 to see more stars on the Walk of Fame, Ellen DeGeneres in particular! We enjoyed a quick breakfast and walked our butts off! We were back in the hotel and changed so we could head to Burbank by 11am. Once in Burbank, we checked in with security at the Ellen show and walked down the street for lunch. We found this great little Italian restaurant, CiaoCristina! YUM!! I ate a big ole plate of Alla Vodka - I worked up an appetite from all the walking earlier ;) We headed back to the waiting area for the show where we hung out for a bit. They actually decided to start taping earlier then originally planned at 4pm, so that made the wait shorter! We had to get in line and got our tickets to get into the audience. The show was great! We saw Kim Kardashian, Tracee Ellis Ross & Jake Owen performed!! It was a little hard to see some times because I had the Jolly Green Giant in the row in front of us...so I was constantly trying to see around him. Short people should get a little benefit and not have to sit/stand behind someone over 6 foot tall! Not cool! The show is full of so much energy! You are dancing and cheering the whole time!!! I have no voice today as a result of my screaming :/ We were in the 4th row on the side nearest to tWitch! It was amazing seeing him dance in person - I wish I had 1 millionth of his talent! And for those curious, yes, Kim's rear end looks as big and round in person as it does in photos/on tv - lol. 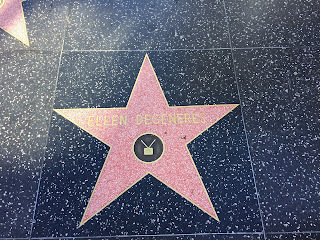 It was great seeing Ellen in person. I know she can't meet everyone, but it would be nice to be able to tell her how much I admire her and enjoy the show. I look forward to 4pm every weekday, so I can watch and use my vest...who would ever think I would look forward to the time of day I use my vest?! I love her love of animals, she's kind and encourages others to be kind. She's just fantastic! After, we went back to the hotel so we could freshen up and go eat. (If you can't tell, eating is a priority when traveling with me ;)) That night we ate at Musso & Frank Grill. It had an old mob-type feel & great food. On the walk back, we decided to snag some dessert from Ghirardelli. Then off to bed for an early departure. How could you not stop for Ice Cream?!?! I had so much fun spending time with my Aunt Arlene!! I love that we enjoying going places together :) She's such a blessing to me and I have no clue what I would do without her. I can't wait for our next adventure!! !